You Can Do All Things Through Christ Who Infuses You with Inner Strength! 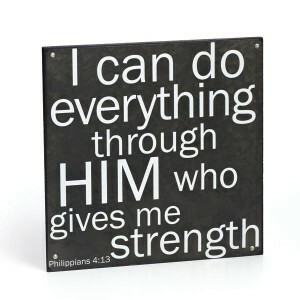 You can do all things through Christ! Do you believe it? Or was Paul just talking about himself? Can you really do all things through Christ? Paul was a Christian, the same as you and I. There are no special privileges afforded any Christian over another though God can do ‘special miracles if he wants. That’s God’s prerogative. I’m still trying to figure out what ‘special miracles’ are because in my mind, all miracles are pretty special. Let’s look at the Amplified Bible translation of the verse I’m referring to. Philippians 4:13 I have strength for all things in Christ Who empowers me [I am ready for anything and equal to anything through Him Who infuses inner strength into me; I am self-sufficient in Christ’s sufficiency]. I chose the Amplified Bible translation because it captures more of the essence of the original text for this verse. Isn’t it a powerful verse? “I am ready for anything and equal to anything through Him who infuses me with inner strength.” Wow. What a confident statement from a man who did exploits in Jesus’ name. I have personal experience regarding the power available to us in the name of Jesus Christ. God graciously worked two miracles in my life at two different times when I used that name to do what I could not do on my own in the natural realm. I’d like to share one of those experiences with you now, but the reason I’m sharing this with you is to exalt Jesus and the power in his name, not to bring any kind of glory to myself. In fact, God can do the same through anyone who listens and obeys his voice. Do you believe it? It was a hot day and dark clouds were quickly forming over the entire grounds. All of a sudden, a cloud burst ensued and the winds kicked up considerably. Tents were blown over and the dirt paths became instant pools of mud. Mothers and fathers were running around grabbing their children to take them into nearby hard shelters and everyone was in a hurried state of frenzy. 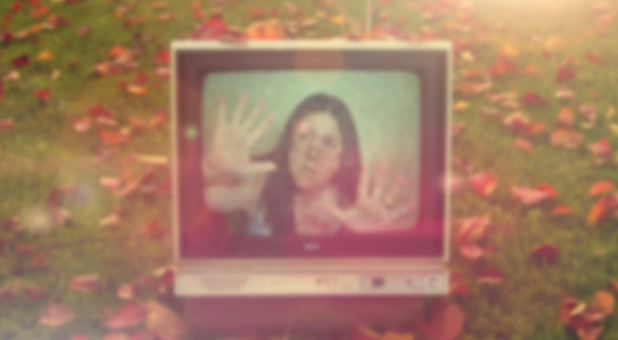 As I observed the mayhem and looked where I could offer help, a strange feeling came to me. I felt that was happening was not God’s will. I never connected it with the devil trying to wash out the event, but I suppose that’s what was happening. Nevertheless, I continued walking and observing. I could not get rid of the feeling that this was not God’s will. It got so strong that I felt I had to do something about it. I had been a Christian for years, but I had only started studying and understanding God’s Word for the previous two to three months. I didn’t know much of the Bible, but what came to mind was the fact that we have power in the name of Jesus Christ. When that thought crossed my mind, I decided to try it out. I said to myself, silently in my mind, “In the name of Jesus Christ stop raining.” I walked a few more steps and nothing changed. My thoughts had no effect. There were a half dozen or so people directly around me, but they didn’t hear me because I just thought the words instead of saying them. My heart sunk because nothing happened. I was on a quest for truth, not religion, and if what I had read was not true, I didn’t want anything to do with it. I was in a quandary and walked a few more steps. Then something very strange happened. All of a sudden, verses from Genesis chapter 1 started streaming through my head. That’s all I needed. Those verses streaming through my mind, though I was not that familiar with them, told me that GOD SAID — I had to say it instead of just think it. Before the last word was out of my mouth, the cloudburst instantly stopped. Everybody near me looked at me as if I was crazy and one person said, “It wasn’t him — the rain stopped because we were all believing for it to stop.” I knew differently. My Lord communicated with me by doing what he had to do to make me understand what his will and what I was supposed to do to manifest it. You may not believe what I’m saying here, but that is entirely up to you. I lived it and I know exactly what happened though I cannot tell you how or why God chose me to do this work. The benefit of the work blessed everyone at the festival. The winds calmed and the wild storm stopped instantly in its tracks. People didn’t have to run to shelters and the festival didn’t have to end early. There was a positive, godly effect produced by the miracle. I was overjoyed in God’s presence. God had confirmed his Word to me, and not only that — he showed me he was willing to work with me to help establish his will on earth. The phrase of the Lord’s prayer, “Thy will be done on earth, even as it is in heaven” took on life for me. Yes, it was possible for God to exert his will on earth. It was possible for me to walk with God and manifest his power in the name of Jesus Christ. My life took on an entirely new, spiritual dimension. A week later, I was walking arond a large lake in a park in Minnesota, rejoicing in my new understanding that through Christ I had power over the universe even as Christ had. I noticed there were several trees with a band of paint around them which means they were marked to be cut down because they had Dutch Elm disease. Trees with Dutch Elm disease are cut down to protect the health, non-infected trees. Nothing happened. My heart sank once again. Now I was really confused. Just a week earlier I had commanded the rain to stop in the name of Jesus and it stopped immediately. I started thinking maybe that person who said, ‘It wasn’t him…” was correct. As soon as I had that thought, another thought came into my mind. You can do what God tells you to do; you cannot do what you want to do on your own. Let me say that again because it’s a potent truth. You can only do what God tells you to do. That’s more emphatic. ONLY what God tells you to do, can you do. The fellowship I was involved in taught what they called, “the law of believing.” It’s still a common teaching today among the more charismatic, spirit-filled groups. They use the following verse from Matthew to cooberate their teachings. Matthew 17:20 for verily I say unto you, If you have faith as a grain of mustard seed, you shall say unto this mountain, Remove from here to yonder place; and it shall remove; and nothing shall be impossible unto you. Really? Can anyone who believes move a physical mountain? This same verse is used by the spiritualists to say you have power over the universe if you only believe. On the surface they appear to be correct. Taken on its own, without the context of the rest of the Bible, that’s exactly what the verse in Matthew says. But every verse in the Bible is contextual. The verse must be understood in it’s immediate and remote contexts. That means, to understand a verse with its intended meaning, you have to consider the verses directly around it as well as all the other verses in the Bible. You have to consider context as well as who the verse is written to and who it concerns. The entire context of the Bible says that God’s will is the predominant consideration. Have a look at the following verses and see for yourself. And if we know that he hears us, whatsoever we ask, we know that we have the requests that we desired of him. That’s very clear, correct? “If we ask anything according to his will… we know that we have the requests we desired of him.” That’s the key right there — knowing what God’s will is and ‘asking’ according to his will. Commanding something to happen in the name of Jesus is no different. If God tells you to do something, all you have to do is act and it shall come to pass. John 14:14 If you shall ask anything in my name, I will do it. To ‘ask in his name’ is to ask according to his will. He’s not talking about a magic formula here. ‘in the name’ of someone has always meant, ‘by the power vested in that name.’ An ambassador is a direct representative of a country. When an ambassador says, “In the name of the king I give you the right” to do whatever, the ambassador is saying, “By the power vested in the king I have been told to extend this privilege” to you. John 15:5 I am the vine, you are the branches: He that abides in me, and I in him, the same brings forth much fruit: for without me you can do nothing. Again, without him you can do nothing. You can do nothing on your own, and you have no ability to exercise power he has not delegated to you. The word “abide” in that verse is the Greek word, “meno” and means, “to stay within the bounds of.” I did an extensive word study on that word many years ago; it’s used 15 times in that John 15 passage alone! The entire gist of that passage is to think and live within the bounds of Jesus Christ, in other words, to do his will. That includes asking according to his will. You ca do miracles in the name of Jesus Christ when God tells you to. Be open to God. Believe God. Trust that he knows how to communicate with you, even as he did with me with the streaming of his Word into my mind, exactly what I needed to hear when I heard it. He knew exactly how to communicate his will to me — without hours of prayer and mediation trying to ‘connect’ with him. Leave those pagan thoughts aside — God can communicate with you in a cloudburst, an earthquake, in the most unsettling of circumstances. He knows you and how you will respond. This article has been quite lengthy but I hope you learned something valuable from it. Thank you for your time and remember — you can do all things through Christ who infuses you with inner strength! Praise God for his goodness, grace and mercy. Comedy used to be funny, heart-lifting and clean. But modern comedy is nothing to laugh about. It’s no joke: Modern comedy is a downright assault on righteousness. I remember when I used to watch comedy shows on television, such as Gilligan’s Island. The humor was clean, fun and showed how silly we humans can be. Yes, there were elements of ‘dirty’ comedy back then — Red Fox for example, but those acts were in the minority. Fast forward to today and it’s hard to find any comedy show without being assaulted by incessant hard-core swearing and grossness. Modern comedy is more perverted than ever and the end result is the perversion of our culture. I refuse to go to comedy shows now because I get more irritated than entertained. In this article from Charisma’s online magazine, modern comedy is rebuffed for it’s blatant immorality. Something is terribly wrong with comedy in our country. Decadence is rapidly replacing decency. If it’s offensive, embarrassing and raunchy, you’ve hit the mark. The more today’s comedians can push the envelope, the more they’re hailed as cool, hilarious and cutting edge. The Latin root of decadence means “to fall down.” It is not speaking of mere excess but rather deterioration, decay and decline of that which is moral. Synonyms include “debased, degraded, gone to the dogs.” Tragically, that is what has happened for the most part to comedy in our culture today. Have you noticed or are you like millions being subtly seduced? Worse yet, are you grabbing your spouse or your friends and inviting them to come along and guffaw? Recently I checked out of a hotel but not before engaging the lady at the counter for a possible gospel-sharing opportunity. She related to me how her husband had just taken her to see a certain comedian (whose reputation is pure filth). She admitted that she sat there blushing, squirming, wincing and cringing at the nonstop profanity and sexual themes but didn’t realize what she was getting into when her husband first invited her. Has this happened to you lately with a TV show, movie or an evening at a comedy club or event? Brace yourself because without revival in our nation it’s going to get worse. I don’t say this to discourage us but rather motivate all of us to cry out to God in repentance for our nation and for a desperately needed awakening in our day. George Otis, Jr. who has traveled the world for over 20 years documenting genuine revivals, tells us the three essentials for transformation: 1. Realizing the gravity of the situation. 2. Understanding that time is running out. 3. Responding to God’s lifeline of opportunity through repentance and passionately seeking God. Here’s the deal: One of the reasons that I write these commentaries each week is to sober readers across America that time is running out! This theme is simply another area that we need to awaken to that our culture is collapsing. This is not hyperbole but reality. Modern comedy is promoting immorality, mocks Christianity and criticizes righteousness in general. It’s time that people who care about our culture boycott those who spew forth such nonsense for without an audience, they cannot survive. It’s the purse strings that control what gets the light of day in the entertainment field, and it’s or duty as Christians to stand up for what is right. Our admonition is to eschew evil and pursue that which is good. Action Follows Belief: What are You Believing Today? Action follows belief. People’s actions are evidence of what they believe. If you are wondering what you believe, take a look at the actions you are taking on a regular basis. Let’s take today. What are you doing today? What does that say about what you believe? Let me give you an example. A person who needs a job is looking through the job sites on the World Wide Web. What does this person believe? On first appearance, it seems this person believes he will find a suitable job by the actions he is taking. But appearances are not everything. As he goes through the listings, he is qualifying what he sees. “I can’t do that…”, “That looks like too much work…”; I could never do that, I don’t have the skills…” As we consider his words, we see there is possibly an issue here. Is this person confident he will actually get a job or is he just playing around with the idea? From what he said, we can make several observations. He might have a lack of belief in himself (“I can’t do that…” , “I could never do that…”). On the other hand he might have a bad work ethic, “That looks like too much work.” But we can’t know for sure because we don’t know that person’s heart. The person could just be being honest with himself, knowing his own limitations. Personal judgments and observations aside, if that person actually takes action and submits job applications and follows through with interviews, presenting himself in his best light, then his actions prove what he really believes: He can get a job, he just has to find it. However if he doesn’t apply for a job, or does so haphazardly and blows the interview, then his actions prove something else. Actions trump superficial thoughts. Actions reveal what you really believe. This is the point of a parable our Lord taught a couple thousand years ago. Let’s see what Jesus has to say about this. And he answered, ‘I will not’; but afterward he regretted it and went. The man came to the second and said the same thing; and he answered, ‘I will, sir’; but he did not go. 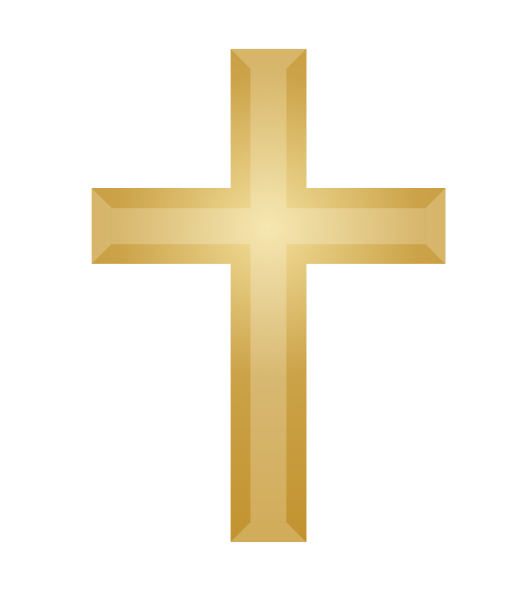 Which of the two did the will of his father?” They said, “The first.” Jesus said to them, “Truly I say to you that the tax collectors and prostitutes will get into the kingdom of God before you. For John came to you in the way of righteousness and you did not believe him; but the tax collectors and prostitutes did believe him; and you, seeing this, did not even feel remorse afterward so as to believe him. The person who said he wouldn’t but then felt remorse and changed his mind and acted was the one who did his father’s will. Though his attitude and perhaps his work ethic needed some adjustments, his actions proved what he really believed, which was that he wanted to do the will of his father. The person who said he would do it had deeper issues. He didn’t keep his word. People who don’t keep their word cannot be trusted. It takes a complete character change to overcome that sin. What Are You Believing Today? Sometimes we fool ourselves. We say we believe something but then our actions totally contradict what we say we believe. I can say I trust God and that God is my sufficiency, but if then go and steal, beg and borrow, then what do I really believe? I think it’s obvious that my actions in that example are not matching up to what I say I believe. So I have a simple question for you: With what you are doing today, what do your actions say about what you believe at this moment in time? Do a checkup from the neck up and see if what you are doing matches what you think you believe. If not, make some adjustments and get your actions lined up with your true beliefs and, as long as what you believe is God-centered, what how God blesses you abundantly. Actions speak louder than words. Remember that and have a great day glorifying God and our Lord Jesus Christ! In God We Trust will Stay on our Money But is it In Our Hearts? The phrase, “In God We Trust” will stay on our money thanks to a Supreme Court decision, but is it in our hearts? In God We Trust; all others must pay cash is a famous funny statement, but I’m being very serious here. Do we trust in God Almighty, creator of the heavens and the earth, or are we trusting in something untrustworthy such as the government, our spiritual leaders, or money itself? Here’s an except from coverage of this Supreme Court decision from ChristianNews.net. 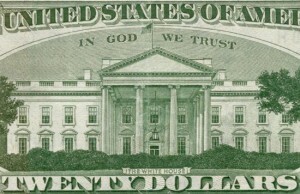 NEW YORK – A federal appeals court has ruled against a prominent atheist and his quest to remove the motto ‘In God We Trust’ from American currency. As previously reported, atheist Michael Newdow, who has filed numerous suits challenging the mixture of God and government, submitted a complaint in the Southern District of New York in March 2013, asserting that the motto violates the Establishment Clause of the United States Constitution as it serves to proselytize unbelievers. Those named in the lawsuit, which included seven children and their parents, along with other singular entities and the group New York City Atheists, remarked that they do not like being forced to look at the name of God on their currency every time they make a purchase. They contended that it makes them feel discriminated against and rejected by society because they have rejected the Creator. “We respectfully disagree that appellants have identified a substantial burden upon their religious practices or beliefs,” the panel also concluded in regard to the atheists’ proselytization claim. The Supreme Court got this one right, praise God! It really doesn’ t matter if it’s on our money or not but having it there causes it to be read millions of times a day, reminding millions of people that God does exist and at least that he should be trusted more than the money in our hands. Thank God for every victory including this one! Progressive Christianity is on the rise in western cultures and is sparking a new resurgence in faith. Is this a good transition or a bad one? The litmus test, of course, is in whether the Bible supports what progressive Christianity is purporting. The further we move from God’s revealed Word and Will to our own justifications, the further we move from God’s blessings and protection. While a resurgence of faith is indeed something to rejoice about, if that faith is not really faith, we are only fooling ourselves. 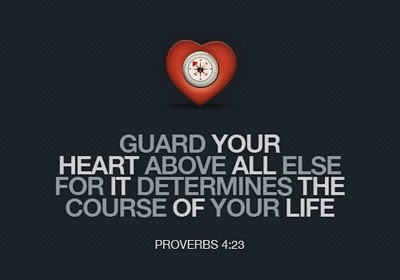 Proverbs 14:2 There is a way which seems right unto a man, but the end thereof are the ways of death. This article explores what’s happening right now in western culture. They call it progressive Christianity. How progressive is it? How sound is it? Let’s find out. Anyone born within the last 50 years would be justified in thinking that Jesus’ teachings and Christian preachings were the exclusive domain of social and fiscal conservatives. The ’70s, ’80s, and ’90s were dominated by Christians with names like Falwell, Robertson, and Dobson who leveraged television and radio to make theirs the default religious voice in America. While important Liberation, Black, Womanist and Feminist theology was being lived out in communities around the world, when the media wanted a “representative” Christian voice it generally turned to these men with the largest megaphones who brought their faith language to conservative political stances on issues such as abortion, the role of women, LGBT rights, the death penalty, social welfare and war. But that is so #TBT (ThrowBackThursday). There has been a largely unnoticed but radical movement over the last decade during which the spiritual fire has shifted to more progressive Christians and that has the potential to change both the political and spiritual landscape of America. I had a feeling this was happening but was shocked during the past few weeks to note the extent to which the more progressive Christian leaders are speaking out and being heard in their effort to impact the public square. Pastors and priests have spoken out on blocked Medicaid expansions, gun control, and climate change. The U.S. Conference of Catholic Bishops continued their push for immigration reform by celebrating a Mass on Capitol Hill, building on the powerful Mass they celebrated weeks earlier at the U.S.-Mexico border. The United Church of Christ continues to push, claiming that their religious right to perform gay marriages is being infringed upon in North Carolina and protesting the FCC’s proposed new rules on Net Neutrality, while over a thousand clergy wrote a letter urging Congress to change drug sentencing laws. Groups like Nuns on a Bus, Sojourners, Red Letter Christians, The Cana Initiative, Moral Mondays, Faithful America and many others are consistently witnessing to injustice in visible — and reportable — ways. Now, when the mainstream media is looking for a Christian to comment on a story, they have a powerful progressive set of voices to chose from. None of this is to say that the hardline religious conservative voice and influence has vanished. There are many on the religious right who still find traction on issues such as the contraception mandate, rallying against science and climate change, and perceived threats on religious freedom. However, these voices no longer control the narrative of what Christians care about, and the perception of a Christian conservative opinion monolith has been shattered. Progressive Christianity is sparking a resurgence in faith, but is that faith sound? Will it stand the test of Scripture? Personally, I fear that the further to the left, the further from God’s Word we go. Issues like homosexuality, government welfare, abortion and the many other pertinent issues causing decline from godly culture need to be addressed by one unified Christian voice. The problem is and always has been our view of the integrity of God’s Word. No matter what we think or feel about any issue, it’s the Word of God that is the final decider of truth. Meekness demands that we understand what God says in his Word and we adopt that thinking in our lifestyles and cultures. That is the only “progressive Christianity” I know of that wins God’s approval. Miracles happen every day, they are not just something you read about in the Bible. I’ve experienced miracles during my life and I hope you have also. In this article, posted on the Charisma Magazine site (link below article), we learn how Christian teachers in San Francisco aggressively chose prayer and fasting to confront cultural issues facing them and their school children. This is an example of faith-in-action which is what Christ in culture, Christian culture, is all about. The students of San Francisco Christian Academy instantly recognize the noise. Academy teachers know the sounds too. Gunfire. Across the street. It’s an otherwise pleasant day in the fall of 2013. As is their routine, a number of the academy’s 120 grade school children walk to recess at a nearby public playground. They know the route along Jones and Ellis Streets is dicey, but they’re accustomed to the scene: dealers selling drugs, homeless people pushing shopping carts, panhandlers asking for handouts, and drunks sleeping on broken slabs of sidewalk. 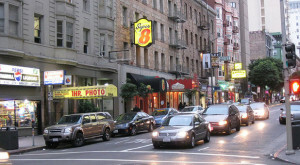 This is the Tenderloin. This is home. Two major crimes take place every hour in this hardscrabble 50-block neighborhood that lies in the shadow of City Hall. Just a week earlier, someone shot a bullet in the night through a window at the academy’s storefront on Jones Street, the building shared with the school’s parent ministry, San Francisco City Impact. What did she do? She bolstered existing safeguards, of course. But she also met with her staff and called for a time of prayer and fasting—exactly what her parents, Roger and Maite Huang, did 29 years earlier when they launched City Impact. Only back then, it was just Roger, Maite and a bag of bologna sandwiches—50, to be exact. Three decades ago, Roger and his wife ventured into the troubled Tenderloin district of San Francisco with their bologna sandwiches and a prayer, and they haven’t looked back. When Ladine called for a time of fasting and prayer after the school’s brush with gunfire last fall, everyone joined in. Within two days of calling for the fast, she received an unsolicited email from a project manager on the San Francisco Bay Bridge extension who had heard about the school and offered help in any way he could.Ladine told him about the need for a rooftop playground so the school’s children no longer had to walk the violent streets of the Tenderloin for their recess breaks, and he offered to spearhead the project at no cost. To date, the ministry has raised $75,000 of the projected $150,000 needed for equipment. Volunteers will build it, and the children in San Francisco Christian Academy’s K-8 school will finally have a safe place to play. Her husband, Clint, who serves as associate pastor of City Impact Church, agrees. Miracles do happen more often than people think. How often? As often as needed is the honest answer. If you need a miracle, God will arrange it. Seek him with prayer and fasting as necessary and let God work in your life. The above article was written by Steven R. Lawson. Steven R. Lawson is a freelance writer and editor living in Southern California. He formerly served as news editor of Charisma and Christian Life. Allison Trowbridge contributed to this story. Art is a big part of culture. In this article by Whitney Hopler, Crosswalk.com contributing writer, the subject of using art to glorify God and invite people into the Christian sheepfold is discussed. The following is a report on the practical applications of Douglas Mann’s new book, The Art of Helping Others: How Artists Can Serve God and Love the World (IVP Books, an imprint of InterVarsity Press, 2014). All Christians are artists, in the sense that God calls all of us to creatively incite people to discover more about him, their Creator. We can do so by sharing the Gospel message in creative ways as we relate to others during our daily lives. Whether or not we create traditional artwork (such as songs, stories, paintings, or sculptures), we can live artistically by showing people glimpses of God’s redemptive work in this fallen world and inspiring them to connect with the Master Artist who wants to transform their lives. Humbly accept and learn from the suffering you experience. Suffering is an unavoidable reality for everyone in this world that sin has broken – and Christians, especially, must face that suffering rather than trying to avoid it, because what we learn from suffering helps us become stronger people who grow to be more like Jesus Christ. But in order to learn from the suffering you go through, you must overcome pride that deceives you into thinking that somehow you should be above human suffering. Pray for the humility you need to trust God when he allows you to experience suffering. Seek out the wisdom you can gain from going through difficult circumstances while relying on God. Then take what you’ve learned and use it to help other people who are suffering in the ways you’ve suffered. As you do, the Holy Spirit will empower you to create conversations and projects that will help bring hope and healing to others. Answer God’s call to serve as a creative inciter. Jesus was a creative inciter: someone who used creative energy to bring about positive change in the world. God calls all Christians to follow Jesus’ example by using our God-given creativity to be an agent of change in whatever situations we encounter. Any work you do to creatively help solve problems in the world and help people move closer to God is a way of expressing your artistry as a Christian. Pray for the Holy Spirit to help you give of yourself from the uniqueness of how God made you. Just as Jesus used artistry in how he communicated with people (from telling creative stories to solving people’s problems creatively), you can communicate in creative ways that point people to God and help change their lives for the better. We feel art can be used in many ways to bless God’s people and to promote Christ in culture. Use your talent to the best of your ability and God will help you reach people who can be reached in no other way. What is your attitude when you are on the job, working for a living? “Working for a living’ is quite a phrase, isn’t it? We live in this world and have to work for sustenance and so we have a roof over our head. Our attitude when we work has everything to do with our well-being. A bad attitude will work like poison on your mind and body, making your job seem like drudgery. But a good attitude, even with a job you might not like, will make the day go much better. Let’s see what the Bible has to say about this. There are many things you can do in life. I remember when I was a child, I’d often get asked by adults, “What do you want to be when you grow up?” I never had a good answer for those who asked, but it wasn’t because I had no motivation. I have so many interests that I could never settle on one thing. The sad fact is most people end up ‘being’ or ‘doing’ what they never dreamed they wanted to. The iron worker who labors hard and goes home exhausted us usually doing what he is able to do, what he has to do to earn a living for himself and his family. The office worker who spends 55 hours a week slaving away never wanted her life to end up with that vocation. Those who do end up doing what they want are particularly blessed in this world. Yes there are some, and to them, going to work is a joy. Most often, they look forward to going to work each day because they are able to do what they like. But sometimes even those situations are not optimum. Sometimes they are doing what they want but the complications they encounter make it less than what they originally envisioned. Whether you are able to do what you want or not, as Christians, our attitude is different. God wants us to think of things longer-term. 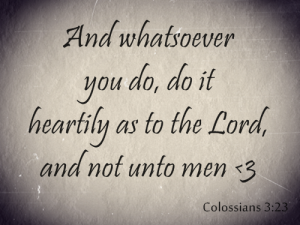 Here’s a verse from Colossians that sums up what I want to communicate to you today. Colossians 3:17,23,24 And whatsoever ye do in word or deed, do all in the name of the Lord Jesus, giving thanks to God and the Father by him. Knowing that of the Lord you shall receive the reward of the inheritance: for you serve the Lord Christ. 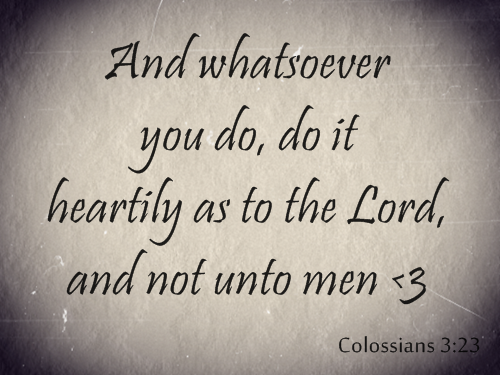 Whatever you do, do it unto the Lord. We are able to change our attitude because we know the bigger picture. We have been promised the ‘reward of the inheritance’ which puts any work we do in this world in a better, truer perspective. We receive a temporal reward for what we do on the job. We get paid our salaries or hourly wages and perhaps a bonus and a few vacation days and other significant or insignificant benefits. But Christians have something much bigger already — that will be fully paid in the future at Christ’s return. We have an inheritance in Christ that supersedes anything we can earn in this world. Galatians 3:29 And if you are Christ’s, then are you Abraham’s descendants, and heirs according to the promise. We are heirs of the inheritance God promised to Abraham! Christ is the heir and we share in the full inheritance given to Christ. Think of that the next time you go to work and it will lift your day. Whatever you do in word or deed, do it heartily as unto the Lord and not unto men because you have received the inheritance God promised to those who worship him. Our Lord Jesus Christ earned it for us by his life and sacrifice. It’s ours freely in Christ Jesus. Remember this and your day will be brighter whether you like your job or not.